We recently went on a road trip to California and I knew it would be a stretch for my kids to not only be happy in the car but to be NICE too. I planned ahead and looked for great ideas to help make our trip more enjoyable. In the long run, I just hoped to SURVIVE. I was pleasantly surprised at how well they did. 10-11 hours each way was not very comfortable but it worked! Here are some of the ideas I used that helped us have a successful & ‘mostly happy’ trip! I’ve also added a few extras that I have found since we came home that I wish we had used! 1. Assigned seating! I purposely put certain children in specific places next to specific siblings. If you know that 2 of your children have a harder time getting along, you might want to separate them BEFORE you get on the road! I also put my oldest next to the toddler so that she could help him be happy since I was in the front. Long Road Trip +a good night’s sleep = Happy kids on the Disneyland tram! 2. Travel Bags. This was the biggest hit of the trip! I bought reusable bags for each of my kids and filled them with things to keep them busy for their particular age. They loved their bags so much, that even when we got home from our trip, they begged to take them to church! 3. Road Trip Binders. This took a lot of time on my part but I’m so glad I made them. Lucky for you, I wrote a post about it with ALL the free printables I used, links to everything I used, and even a video of how I put it all together! You can find that post here! 5. Good Behavior incentives. I made pretend money (free printable car bucks here) and my kids earned it for good behavior or going the extra mile before and during the trip. They then could trade those in for real money on our vacation to buy souvenirs or other goodies. My sister has used quarters with great success also! 6. Car Kit. This was one thing I wish I had been better at preparing is a car kit to keep in the front seat. I had the basics spread throughout our bags but it would have been nice to have them all in one place. Mother’s Niche has done a great post on how to put one together here. 7. Pack it tight, but pack it right! I learned this one the hard way on the way to California and did it the right way on the way back. If you have several people in your family and you will be staying in more than one hotel take this one piece of advice! Pack a bag for each hotel rather than a bag for each person for the entire trip. It was such a PAIN to have to get everyone’s bag out at the hotels and then pack them back up again the next morning. On the way back, I just packed a set of clothes for each person in ONE bag for the hotel….SO. MUCH. EASIER! 8. Games for focusing OUTSIDE of the car! I found that when my kids started getting cranky and mean with each other, the stuff we had INSIDE the car didn’t do a whole lot of good. What did work was a game to focus their minds outside of our jam-packed crowded car. We had them find different license plates or find each letter of the alphabet. Even my tween daughter joined in and it saved me some much-needed sanity for about an hour. 9. A heck of a LOT of PATIENCE! I had to keep reminding myself when kids got cranky or when I got cranky, that we were on this vacation to build HAPPY memories and build meaningful relationships with one another. I mean, let’s be honest, vacations with kids are not really VACATIONS, but rather opportunities to bond with the ones that matter most in our lives. If I want a REAL vacation, I’ll pay a babysitter and go off somewhere with just my husband! That’s not a bad idea, by the way. Plan a vacation with your husband AFTER the vacation with the kids. You’ll thank me later! 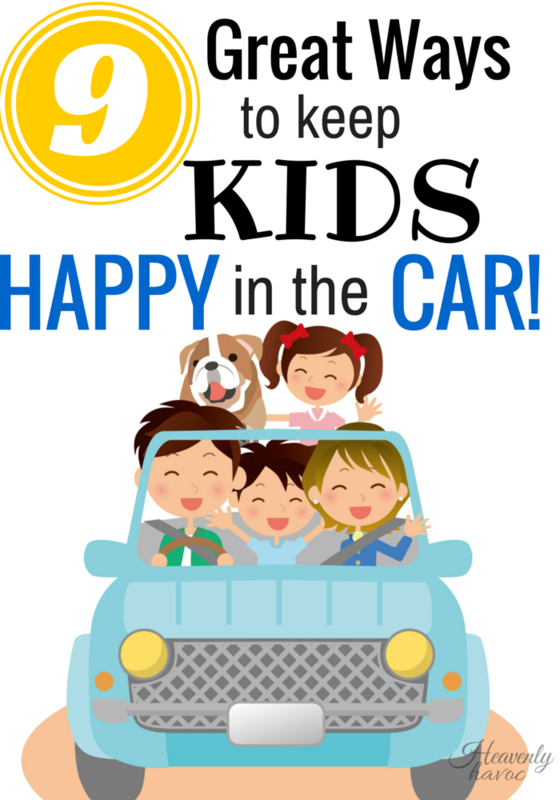 What other ways have you found for keeping your kids happy in the car? Please share! I know a lot of frazzled moms who will thank you!